One in 10 Americans depends on the Colorado River for bathing and drinking. Last fall's record-high temperatures reduced Colorado snowpack in winter 2018 to 66 percent of normal, sparking concern over water shortages downstream and leaving water managers fearful of a repeat. Diminishing snowpack isn't all that affects water reserves. At many sites across the West where the federal Natural Resources Conservation Service measures the amount of water contained within snow, this snow-water equivalent was less than half of median values from 1981 to 2010. At the same time, snow is melting near the Colorado River's headwaters almost a month earlier than it did 25 years ago. This earlier melt alone has caused shifts in plant communities that function to absorb nutrients, process pollutants, and filter sediment as water moves downstream – increasing the odds that water quality, not just water supply, will be put at risk by a warming atmosphere. 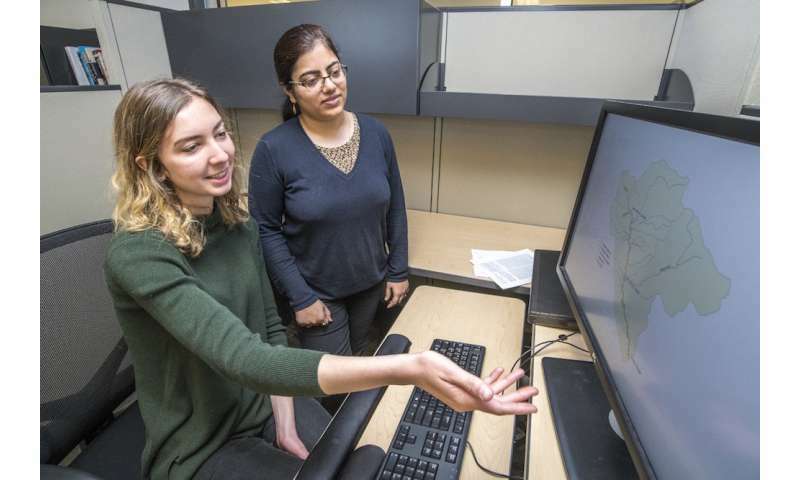 Hydrological science expert and geochemist Bhavna Arora is part of a team at the Department of Energy's Lawrence Berkeley National Laboratory (Berkeley Lab) studying the changes to these plant communities in a research area along the East River catchment near the Upper Colorado River headwaters. The team's studies, part of the Watershed Function Scientific Focus Area (SFA) program, are useful for predicting how disturbances to mountainous watersheds – like floods, drought, changing snowpack and earlier snowmelt – impact the downstream delivery of water, nutrients, carbon, and metals. A. Snow is melting an average of 26 days earlier than it did 25 years ago – a phenomenon that's forced a dramatic shift in plant communities in and around the Upper Colorado River. When snow melts far sooner than expected, nitrates produced naturally beneath snow can be released much earlier in the watershed. 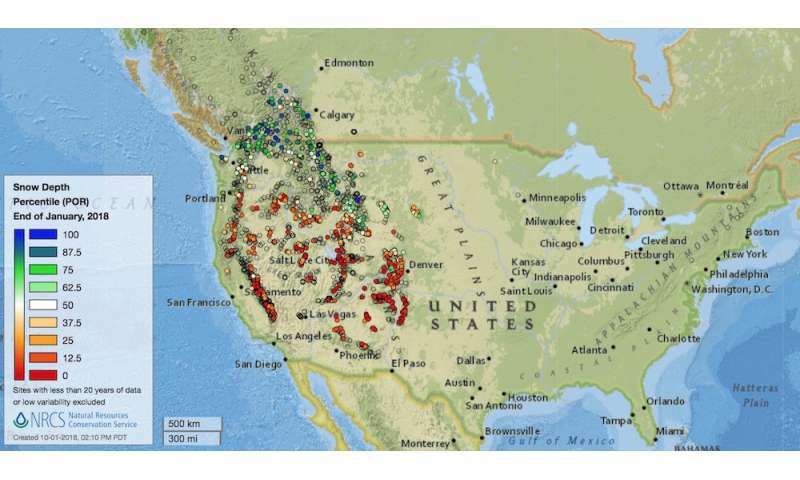 Regional plants that historically functioned synchronously within the ecosystem to absorb nutrients from water within snowmelt have been replaced or risk being replaced by more drought-resistant plants that may not be so adept at taking up nitrogen. 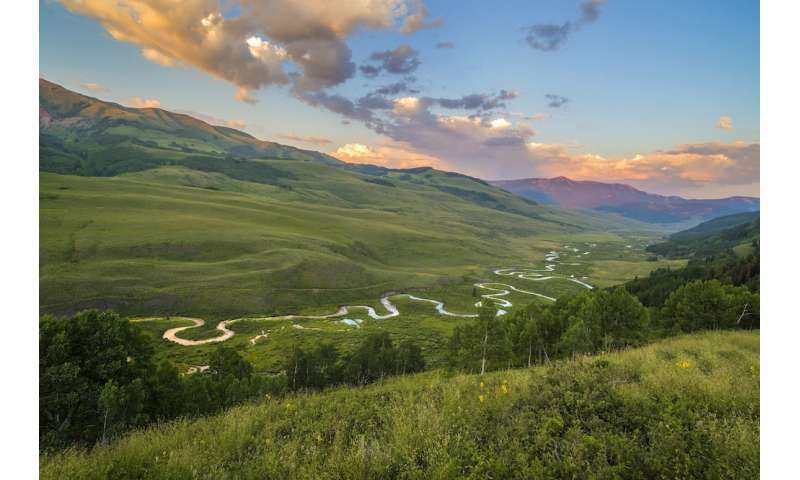 At the East River, Colorado, catchment site that is the project test bed, a community of deep-rooted shrubs has replaced grasses and wildflowers, which rapidly take up nitrogen and other elements from water within snowmelt. It's not yet clear if these new plants can quickly assume the roles of their predecessors and prevent nitrates or other elements from entering the river and traveling downstream. In just under two short years since our team began studying there, we've witnessed earlier snowmelt accompanied by the diminished snowpack that has become so familiar across entire regions of the mountainous West. We wanted to quantify the influence of changes in snowmelt timing and snowpack depth on nitrogen fluxes and plant phenology at our study site. We're using remote sensing and wells that penetrate deep into the bedrock to continuously monitor vegetation, seasonal soil temperatures, water availability, and chemistry throughout the soil and subsurface at the East River site. Our observations and computer simulations show that an earlier and larger nitrate peak occurs with early snowmelt in comparison to a normal snowmelt scenario. We also found that differences in snowpack depths change the under-snow nutrient buffer and ammonia concentration. In both scenarios of early snowmelt and decreased snowpack, shrubs have replaced grasses and wildflowers as the dominant vegetation. A. Headwaters catchments like the East River represent a section of river that has not been impacted by land use changes such as agriculture. What's troubling is not the concentrations we're seeing at these pristine research sites but what that means for water as it moves downstream. The peaks in nitrates after a long, extended drought are particularly worrisome because the risks of excess nitrates to human health are well-known and worthy of our attention. Intense rainfall like we've experienced leads to excess nitrates being leached into the river, which could put downstream water supplies at risk. Without investigating many more sites over multiple years, it's far too soon to say how increased nitrate concentration in headwater catchments could impact runoff as it moves downstream. But it's reasonable to believe that it could. Take agricultural regions, for example. Historically we've added nitrogen to farmland soils as fertilizer. As a result, there's been a build-up of groundwater nitrates and nitrous oxide emissions to the air across major agricultural regions. So, while excess nitrates in the water near our remote research site might not pose a significant threat to human health, we can't be sure that the same is true downstream in waters in and around lands that are intensively used. A. Snowmelt timing is critical to plant growth and growing season duration, setting the starting point for when plants emerge from their winter dormancy and begin to grow. The exact timing of snowmelt is also critical to our work as it represents one of the most important and dynamic times of the year – a period when there's a lot to study and understand. With shifts in plant communities due to early snowmelt, we don't yet know how well those new plant communities will work together to absorb nitrogen and other nutrients. Since those new plant communities may take years to become established, we need to use computer models to predict what might happen. With the shift in snowmelt timing from historic trends – and in flux even from year to year, it becomes even more difficult to predict what changes in temperature and precipitation patterns will mean for the water supply in two years, much less 10 or 50 years.